Sage North America have just updated their internal support pages to add in several links that contain tips for a smooth upgrade to their latest version of MAS 90 and MAS 200 – version 4.4. 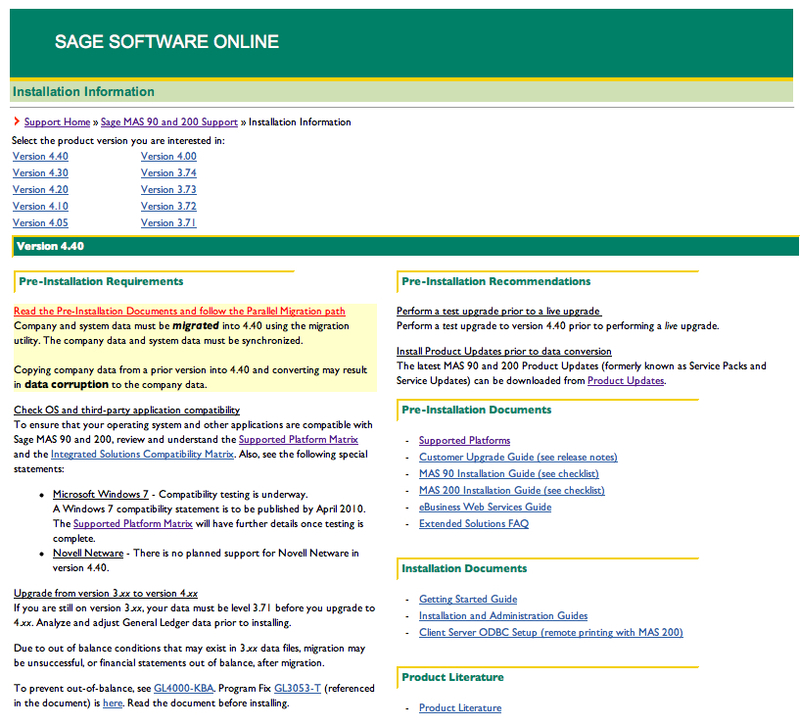 The new section contains links to the Sage Supported Platform Matrix and Integrated Solutions Compatibility Matrix. Both of these important documents show which operating systems and third party applications have been reviewed and deemed compatible with MAS90 4.4. Users of Windows 7 and Novell either have a short wait or face the uncertainty of running on an as-yet unsupported platform as outlined by the following announcement on Sage’s support site. Support for Windows 7 is expected within a short time while the Novell platform has been removed as one that Sage will support for MAS90 and MAS200 version 4.4+.